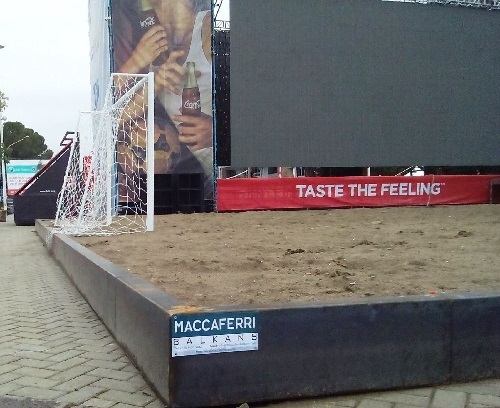 Maccaferri’s geotextile is paved under beach volley fields in the Tirana Fan Zone project. The “Tirana Fan Zone” is a project of the Municipality of Tirana designed for football fans supporting Team Albania competing in Euro 2016 championship. The Albanian National Football Team is participating, for the first time in the country’s history, to this important European competition. The Fan Zone is an important project as it lets supporters gathering in a common space in order to practice sports and enjoy the show. The project consists not just in a big TV screen, but also in a sports and an entertainment center where you can have fun during the summer. It has been an honor, for Maccaferri Balkans, to be a sponsor in this project, dedicated to the event of the year in Albania. Maccaferri, specifically, has been a key provider of geotextile products for two beach volley fields. Mactex H 35.1 was used in order to maintain the sand within the playing perimeter. Geotextiles are paved beneath the ground in order to ensure, in case of falling rain, that sand particles are saved and that only water is drained. This is how Maccaferri’s technologies can make sure that everyone will be able to play beach volley in the sand in Mother Theresa Square downtown of Tirana.